This was such a great day!! June Buggy went back to sleep about 7am, so I headed to the buffet alone, as I had been up since 3am and was hungry. Rose, the manager who got Juna's first smile, came over to say hello. I told her I wanted to do some shopping but did not know where to go. She got out a piece of paper and asked for my room number. "At 3pm, I call you, we go shopping!" After Matt and Buggy ate breakfast, we joined our travel group in the lobby and headed in the blasted heat to the Pavillion. Two mins into the journey and Juna and Mommy were both melting down. Bug has discovered she loves AC as much as we do. Oh, and she refuses to ride in a stroller. The Mei Tai is too warm, so we bailed on the Pavillion sight seeing. It was so hot, we were unable to video tape- the lens kept steaming up. I did get this picture before we made our exit. You can see members of our travel group buying fans from a vendor. We later learned others bailed out, too. It was just THAT hot. We wandered the streets of Nanchang- as the sidewalks are mostly covered by awnings and it actually feels slightly better in the shade. 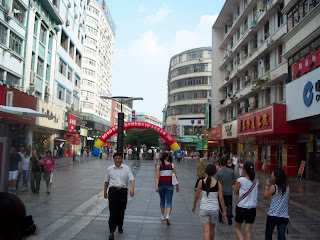 We crossed our first Nanchang street. Let me tell you, with no rules on the road, that was frightening for the first time. I am learning that everyone has the right of way in China. The right to do whatever they want on the road. You want to drive down the wrong side of the street? Ok. You want to walk right in front of a bus? Sure, why not. You want to ride your bike in the middle of the street into oncoming traffic? Hey, why not! We stopped in at Tiffani's, which is an adoption tourist trap right across from the Gloria Plaza. 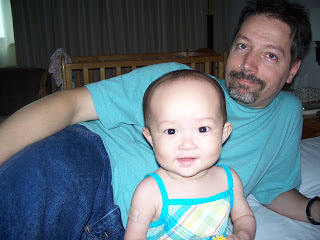 We asked to have our daughter's finding ad, but have learned the Suichuan ads are hard to come by. So we headed back to the hotel to cool off and feed Buggy. We played on the bed and that's when she gave us this beautiful smile! She was a much more animated baby today. Still very serious, still very worried when she got hungry or tired. She claws at her skin, so frantic when that happens. Nap or bedtime is the worst. Her nanny said she was rocked to sleep. She does not settle well on our chests or next to us in bed. We are trying to figure out a solution. Otherwise, she was such a happy baby when she played today. We have discovered that she LOVES to accomplish- anything, really! If we stand her up on her feet, she will grin and giggle like mad. When we help her "walk," she will laugh herself silly. She also loves to be picked up by her little hands while laying down, so that she goes into a seated position, then into a standing position. She laughs and looks so proud of herself. She can also push up on all fours, as if she is attempting to get into a seated position. This is a baby who wants to be as mobile as possible and SOON! And boy can this kid eat. Don't you dare try to eat a Chinese BBQ potato chip in front of her (again, YUM) She would eat all day long if she could. Buggy took another nap around 12 noon. I tried, but the baby next door was freaking out and wailing so hard. Poor baby girl! I decided to head downstairs to the lunch buffet. Oh you would have died if you saw my plate. A lovely layer of rice, topped with squid- not pieces of squid, the entire tiny octopus looking creature. Keeping those guys company were some jelly fish and chicken gizzards. I'm telling you, it was good dining. I ate with my chopsticks and munched down so much, I went back for thirds. While dining, I was approached by one of the wait staff. He introduced himself and said he would be going with Rose and I on our shopping trip, as he was fluent in English and Rose was not confident in her speaking. He warned me it would be very hot so please dress the baby in cool clothing and bring an umbrella for her to keep the sun off her skin. So cute to hear this from a 22 year old kid! Matt and Bug joined me at the buffet. Matt had fish and chicken. No squid for him. The lobby was filled with Japanese tourists who snapped several pictures of all the adopting families who hang out in the lobby. They are fascinated by us and we are a plenty in this hotel! There must be at least four or five travel groups here in this hotel alone. At 3pm, we took our laundry to our guide's room. It will be cleaned by Elephant King Laundry. They return the laundry to our room with our socks sewn together so they are not lost. Also, all items are sealed in plastic bags. It's not as good as the Novotel City Gate's laundry in Hong Kong. But it's half as much. One large load is about 15 USD and worth every penny. That's when Rose called. We went to the lobby and saw that she had dressed up so nicely for our outing! I felt bad, since I was in my usual Tshirt and Capris that truly are two sizes too big for me now. There are mirrors everywhere in this hotel and I look like my mama dresses me funny. Seriously, I need to go shopping for clothes when we get back to the States. It's bad enough that the owner of Tiffani's said to me, "Why do you hide in such big clothes? Show off that curvy figure. So womanly." Yeah, like two women. The thin one wants out, please. 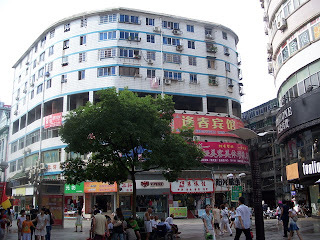 Oh no, time to cross another Nanchang street. Rose took my hand. It is very common for ladies to hold hands here in China. It's just what friends do. It's cute to see the young girls especially. They lock arms or hold hands and stroll around together. Not "girlfriends" girlfriends. Just friends. Otherwise, you do not see much public display of affection here between males and females or males and males. We met up with Jason and walked IN THE STREET (EEEEEP) to an outdoor pedestrian mall not far from the hotel. Blocks and blocks of shops just waiting for us and no cars to run us over. We hit some children's clothing stores first. Jason bargained with the shop staff and saved us a lot of money. We did spend a little bit more than necessary on matching Disney outfits for the girls. These adorable Minnie Mouse matching dresses with a subtle Minnie pink print. Then we went to a Chinese wedding dress shop. We were able to get a gorgeous red silk Chinese dress for Miss Boo. In China, babies do not wear the Chinese dresses. It is not for them to wear until they turn 3 years old. The adoption cities have them around the hotels because the parents love to dress their babies in the Chinese dresses. But Chinese families do not do this. Hence, why the wedding shop only started at sizes for a three year old. We headed back onto the street and WOW did we get stares. We were the only Americans there and I do mean ONLY. I guess the adoption gang doesn't make it over there often. The shop keepers were thrilled beyond belief when we'd come into a store. Very nice stores, too. Just like American mall stores, only smaller. Each one gave us big discounts thanks to our new friends. 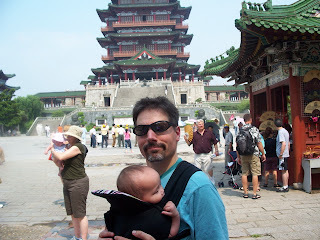 Who, by the way, held our bags and took the baby when we needed our hands free. Ok, they say to not let anyone hold your baby during the bonding process. June Bug? She loved it. She thought Rose was spectacular. Gone was her fear of Asians as she cooed at Rose and Rose spoke Chinese to her. We'd walk a block, then Juna would reach for me and nuzzle me. Then she'd hang out with Jason a bit. Then back to Rose. Then with Matt. Just as happy as could be. Not all babies could pull this off, but we are leaning June Bug is a very special baby indeed. The highlight was walking into a fancy purse store. Oh yeah, purses! My love! I didn't want to go in. I told Jason we could not afford such a store. He said to go in, they would make deals for us. I was afraid to look at the tags. Fancy fancy purses with top notch hardware and leather. High end designs. 20 USD each. No lie. I have never seen such designs in the US and certainly not that kind of quality unless you start at 500 bucks a purse. I think we are going back tomorrow to buy some more. Really, they are spectacular bags. Our new friends suggested we hop the bus or a cab home. We opted for a cab. A Chinese cab! I sat in front and held on for dear life. It was like being in a video game. Frogger, to be honest! That cab driver was insane. We were on the wrong side of the road. We were almost mowing down bike riders. He didn't stop for pedestrians. It was brilliant. I was laughing the whole time. Cab ride cost? 70 cents. Our guides ordered Pizza Hut for dinner. Worst pizza I've ever eaten. No, seriously. Terrible. Like fried cheese on fried bread with no flavor except... fried. I bit into a piece and said, "I want a plate of squid!" When in China, eat Chinese food. Here is the pedestrian mall. And here is a great sign! 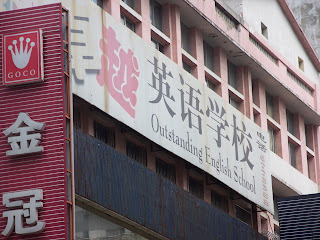 We took a lot of pics of the excellent Chinglish signs that are so funny to Americans. The Chinese do not know why are we laughing so hard at a store called, "Funny Love." 730pm. Time for bed. What a wonderful day, but I'm shattered. Good night from Nanchang! Sounds like a fun day, I hope the rest of your days are equally as good. Ooooh, good shopping. My favorite thing here is the shopping. HK may be more pricey than mainland, but it is still sooooo much cheaper than U.S. on most everything...food, clothes, accesories, transportation. The only expensive things are housing and owning a vehicle, everything else is AMAZINGLY cheaper and it is great. Your trip sounds amazing *sigh* Juna sounds amazing! You lucky, lucky people! Three gorgeous girls! I'd love to shop in China, you're selling me on an overseas trip there, even though heat and humidity make me cry. Wow what an adventure. June Bug will have quite a bit to read in her baby books when she gets old enough to look back over it! So cool that you found a dress for your older princess too. She'll look darling in it. Yeah, you found the shopping area!!! I loved it there. But I missed those bags...darn! And we lasted at the pavilion about an hour - and that was like 5-6 weeks ago. I simply can't imagine what it must be like now. Dripping and melting are the only way to describe it. And I gotta tell ya - I ENJOYED my Pizza Hut pizza there, but I don't think I was as adventurous an eater as you! Looking forward to your thoughts on Guangzhou!!!! Oh how fun!!!! That was my favorite part of the trip - out wandering the streets of Changsha in search of embroidery and whatever. I liked seeing the "real" China. Have Lina teach you how to count in Chinese with your fingers - it is fun to barter in the stores that way. I can't believe that the people from the hotel took you shopping! How sweet is that - never in America huh. Boy sounds like a a fabulous memory to tell Juna about someday. So many of the CHinese people were amoung the kindest people I have ever encountered. I believe it is part of their custom to help visitors and make sure they do a through job of it. I also can't believe you found the cab ride humerous. You are def. made of stronger stuff than I am. What a trouper you are. Kudos to you for eating the jellyfish also. Do you think you will go for snake or something from the insect family in GZ?? If so - I am requesting a photo of the crime scene please. It sounds like your trip is going REALLY well. I will get Harvey to email Matt and let him know the dates we will be in St Louis. WE would love to see you ALL. If you go all the way to the end of the pedestrian street you will find the “local market”. It is like a giant indoor flea market (like the silk market in Beijing). Not much English is spoken, but everyone understands numbers! I got cute shoes and 2-piece outfits for 20 yuan apiece. It was the best shopping in China! I am such a dork! I keep checking your blog and re-reading it. It is bringing back so many memories of our trip as well. I am sitting here pining away - wishing we had gone together. Or that we were there with you now. Oh well! At least we will have lots of notes to compare. Such an emotion packed trip. I can't wait to meet Juna. Okay - off to look at your pictures and have my eyes water some more. Slap a wig of golden curls on that baby's head and you've got yourself a Boo! That is just unreal how much she looks like her big sister. So I couldnt figure out what you meant by "finding ad" and I googled it. Did someone really "find" her? SHe was abandoned? Are they all abandoned? Yucky.